Memory foam is known as a custom-contouring material, and that ability stems directly from its temperature sensitivity. Formulated with visco-elastic polymers, this ingredient reacts to body heat by softening and giving way, allowing the foam to create a user-specific surface, in any position. This characteristic is present in all memory foam products, be they mattresses, bed toppers, pillows, or anything else. While this unique performance trait results in valuable, one-of-a-kind products, the unique nature of its physical performance also means people may not know exactly what to expect from it, compared to more conventional materials and products. Often, it is confused with latex foam, or compared inaccurately. 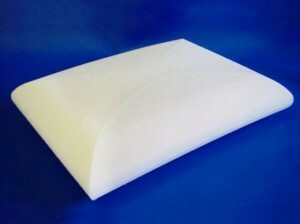 (More on The Foam Factory’s Dunlop Latex bedding products here.) And while it looks like a conventional foam, and the texture feels like a conventional foam, visco-elastic products will not behave in the way basic couch cushions or foam packaging products will. With that temperature-sensitivity being such a differentiating trait, understanding how it impacts performance is the only way you can gauge whether a memory foam product is right for you. With that in mind, we put together a few things you can come to expect from a memory foam product in relation to temperature. First, the ambient temperature of a room does affect memory foam products. Being a product that performs differently when heated by body temperature, it is also affected by the temperature of the space where it is contained. In rooms where memory foam mattresses or pillows are kept with warmer temperatures, the foam’s viscosity will be reduced. Viscoscity – the “visco” aspect of “visco-elastic” – indicates the fluidity of a material. For example, water is more fluid (and less viscous) than molasses. Materials displaying less viscosity behave more fluidly. Of course, memory foam is a solid and remains so no matter the temperature of the room or person using it, but as its viscosity drops, its “fluidity” – flexibility in this case – increases. Conversely, when cooler temperatures are present and the material exhibits increased viscosity, memory foam is more rigid and inflexible. At very cool temps, the material can almost feel hard, compared to the expectation we have for typical open-cell cushioning foam. As warmth is added, either ambiently or through the warmth of a body, it will soften, but understanding that there is a performance window that depends on the material’s environment is important to know when purchasing and using a memory foam product, especially for first-timers. In some locales, where seasonal temperature changes are less noticeable, ambient room temperatures stay fairly consistent, which means the feel of the memory foam is generally the same when you first get in bed. But in parts of the world where the seasons are pronounced – The Foam Factory’s home state of Michigan being one – performance and feel in the winter can certainly be different than in July and August. To a degree, this has to do with the temperature a home is kept at, but for most people, homes are warmer in the summer and cooler in the winter, both because we get used to temperatures and we try not to send our power bills through the roof. Either way, you will ultimately get the same custom-contoured memory sleep surface. In addition to its interaction with the surrounding room’s temperature, there is something else to consider when evaluating memory foam from a temperature standpoint. As memory products soften, you sink into them, and warm deeper areas of the foam. As you do this, more of your body is in contact with warmed foam. This insulating effect causes memory foam to offer a warmer sleep than than other materials. This is a factor that ultimately boils down to personal preference more than anything. Covering fabrics will also impact how much warmth is conducted back to the sleeper as well. And though it’s not going to be like sleeping on a heating pad, memory foam will be warmer than something like an air mattress too. There can be a benefit to this warmth however, especially during cooler times of the year. While it may take a bit longer to soften right off the bat as previously mentioned, it inevitably will. And once it does, you have a pre-warmed, pressure-free sleep surface that’s about as cozy as it can get. As your body sinks into the material, you’re in contact with more of the warmth-retaining foam as well, helping you stay comfortable on even the coldest nights. Like any product, memory foam isn’t going to be perfect for everybody. But for the millions of people who get better sleep and better rest using this material, as well as the millions more looking for a way to get better sleep, a clearer understanding of just what memory foam is and how it performs is the only way to make sure you get the most from your purchase.